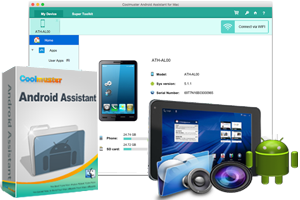 This Mac version of Android Assistant is an indispensable handheld manager for Android users, which is able to edit, transfer and manage various types of Android files including contacts, messages, apps, media files and etc. directly on Mac computer. With multiple functions integrated in one, this software is sure to be your best Android assistant! One-click to backup Android data to Mac and restore your Android device from the backup. It is quite important for Android users to backup their Android data to computer to free up space and keep/restore all Android data from computer whenever they encounter data loss scenarios like accidental deleting, card formatting, factory resetting, device rooting and so on. This Mac Android managing software makes the both operations easy. 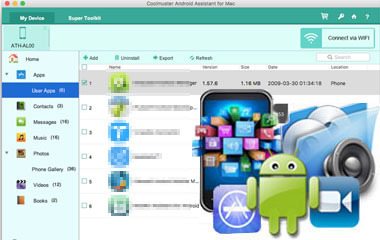 Coolmuster Android Assistant for Mac enables Mac user who is holding an Android device to copy contacts, SMS, music, videos, apps, photos, documents and books from Android devices and tablets to Mac computer. 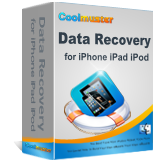 Lost important data from your Android phone? Never mind. Once you kept backup of your Android on Mac, all the backed up data can be restored to your Android device again from the Mac instantly. 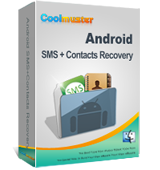 Text group messages from Mac: Coolmuster Android Assistant for Mac is fully capable of sending multiple text messages from computer directly to any phone number, so that you are no need to send messages via mobile phone one by one to waste time. Backup contacts & messages on Mac: Keep a data backup is an efficient method in case of data loss on your Android device. Android Assistant for Mac can help you export the recovered text messages and contacts and backup them as readable and printable formats like .txt, .csv, .bak, .html, .xml or .vcf. Manage phone numbers & SMS on Mac: You are allowed to backup contacts and SMS, add new contacts, import contacts and SMS from computer, delete useless contacts and SMS, edit existing contacts, unduplicated contacts, as well as send & reply text messages on your Mac computer conveniently. 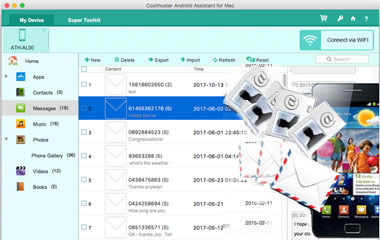 Coolmuster Android Assistant for Mac is a must-have tool for overall App, movies or music enthusiast, because it can not only be acted as a considerate App and media housekeeper to help you better enjoy entertainment to the hilt! App manager: With the help of this Mac tool, there are a variety of apps are available to you to select and download for free for your Android device, and you can backup your Android phone apps to your computer quickly. All the apps can be installed and uninstalled conveniently via Mac computer with one click. Media manager: Android Assistant for Mac is able to analyze your Android phone memory, find all the videos and music files on your phone and allows you to transfer them all to your Mac for backup. On the contrary, you can also download your favorite movies and songs from computer to your Android device as well. 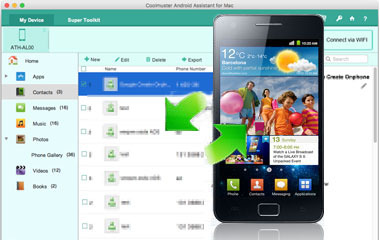 Coolmuster Android Assistant for Mac is fully compatible with all Android-based tablets and mobile phones. It is 100% read-only and risk-free, so that you will never need to think too much about the safety of your device and data. It is completely safe to your Mac OS X and Android device and you can use it without any worry. 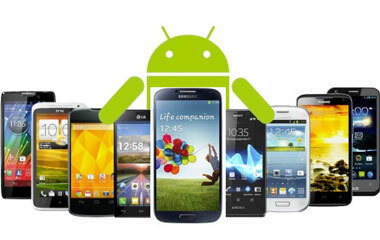 It supports almost all popular Android brands available in the market, such as Samsung, HTC, LG, Sony, Motorola, Google, ZTE, Huawei, etc. and compatible with all available Android OS versions. For any questions, you can feel free to contact our technical team via email. Provide with guidance and technical support free by sending us your queries with email.